We have successfully treated 1000s of patients suffering from varicose veins, spider veins and venous disease. All your office staff at Laser Varicose Vein Treatment Center was very informative and very professional. Ann Marie is a perfect 10. The staff at Laser and Varicose Treatment Center was exceptional. They eased any anxiety I had. I felt very good following my surgery and would recommend the center true heartly. Your staff at the Laser and Varicose Vein Treatment Center were very competent in explaining the procedure to me. I am very satisfied with the results of my procedure. The doctors and staff were excellent. Thank you for all your great work. Excellent treatment. I received answers to all my questions. Very professional yet personable approach to my situation. Timely appointments and knowledgeable staff. Dr. Haq, the Medical Director of the New York Diagnostic Center has performed vascular surgery and Brooklyn vein treatments for 30 years. 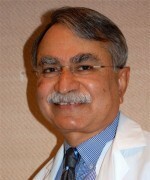 A Board Certified General and Vascular Surgeon, Dr. Haq is also an Assistant Professor of Surgery at Mt. Sinai School of Medicine, and is affiliated with Maimonides Medical Center. Treatment for painful or embarrassing spider veins and varicose veins is now available without the need for invasive vein surgery (or ‘vein stripping’). Laser and Varicose Vein Treatment Center, a leading vein treatment center near Brooklyn, NY offers a range of minimally invasive, state-of-the-art alternatives to vein surgery, including RF closure and sclerotherapy, in the convenience of our Brooklyn, NY office.